First-class seats vary from large reclining seats with more legroom and width than other classes to suites with a fully reclining seat, workstation and TV surrounded by privacy dividers. International first-class seats usually have 147–239 cm (58–94 inches) of seat pitch and 48–89 cm (19–35 inches) of width while domestic flights may have 86–173 cm (34–68 inches) of pitch and 46–56 cm (18–22 inches) in width. In fact this means there is less discomfort for taller people. Some airlines have first-class seats which allow passengers to let one guest sit for a short while face-to-face with the occupant of the cabin. First-class passengers usually have at least one lavatory for their exclusive use, with more than one on larger planes. Business- and economy-class passengers are not normally permitted in the first-class cabin. Normally AVOD (audiovisual on demand) entertainment is offered, although sometimes normal films, television programs and interactive games are provided on medium-large seat-back or armrest-mounted flat panel monitors. Especially for long-haul and high-yielding routes on top airlines, a first-class seat may have facilities akin to a five-star hotel, such as a mini-bar. Since the 1990s, a trend developed in which many airlines eliminated first class sections in favour of an upgraded business class. Newer business class seating is increasing adding features previously exclusive to first class such as convertible lie-flat seats, narrowing the amenities gap to an extent that first class is redundant. Furthermore, with the late 2000s recession, airlines have removed or not installed first class seating in their aircraft, as first class seats are usually double the price of business class but can take up more than twice the room, leaving business class the most expensive seats on such planes. However some, such as Garuda Indonesia, have opted to reintroduce first class seating sections with new aircraft. Etihad Airways' "The Residence" suite. Each of Etihad's ten Airbus A380s have a single "Residence" installed in addition to standard first class suites. With business class seating moving upmarket, some airlines are reintroducing or modelling their first-class sections as suites. Singapore Airlines now markets its highest class on its A380s as "suites", with the tagline "A class above first." The 2 m (78 inches) bed is separate from the seat and folds out from the back wall, with several other components of the suite lowering to accommodate the mattress. Windows are built into the doors and blinds offer privacy. Suites located in the center can form a double bed after the privacy blinds between them are retracted into the ceiling. Other A380 operators like Emirates also have a suite-like first class with similar amenities but the bed and chair are integrated where a button is pushed to turn the seat into a bed in seconds and vice versa. Etihad Airways introduced a three-room suite called "The Residence" in December 2014 when it added the Airbus A380 to its fleet. The Residence includes its own bedroom with double bed, dining/living area and fully functional shower. On most flights within or between the United States (including Alaska but not Hawaii), Canada, Mexico and the Caribbean – what is normally regarded as regional business class or premium economy in the rest of the world is branded as "domestic first class" by US airlines. The service is generally a step below long haul international business class. US territories in the Western Pacific (Guam and the CNMI) and sometimes Hawaii are considered international for service purposes and generally feature long haul business class. However, domestic first class does have two very different meanings on certain transcontinental routes between New York City and California. Delta Airlines, American Airlines, United Airlines, and JetBlue operate a special service on flights between John F. Kennedy International Airport and San Francisco International Airport or Los Angeles International Airport known as "Delta Transcontinental Service," "American flagship service", "United p.s." (p.s. stands for premium service), and "Mint," respectively, with Delta and United using specially configured Boeing 757-200s and American and JetBlue using Airbus A321s. In the cases of American and JetBlue, first class is actually a three-cabin first class which is different from two-cabin first class, both in comfort and price (such as lie flat seats in first class, for example). In these cases, domestic business class is generally slightly higher than a two-cabin domestic first class ticket. The three-cabin first class is more of a true first class rather than a rebranded business class. On JetBlue however, first class is only offered on transcontinental flights, consisting of mini suites or lie-flat seats. US discount carriers (such as Southwest Airlines and Spirit Airlines) do not have first class cabins, instead opting for an all economy layout, sometimes with a few select rows with extra legroom (such as bulkhead and emergency row seats) available for a fee (or, in the case of Southwest, on a first come, first served basis due to their boarding process). 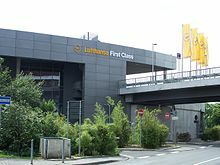 First class service was formerly available on intra-European flights on airlines such as British Airways, Lufthansa and Swissair. First class seats were typically configured in a 4-abreast configuration, similar to current North American domestic first class seats, rather than the 6-abreast configuration used for economy and latterly business class services. During the 1980s European first class was largely phased out in favour of 6-abreast seating throughout the aircraft, with variable numbers of seats allocated to business class (the business class cabin often being marked with a moveable divider). This allowed greater flexibility for the airlines, allowing them to allocate differing amounts of premium seating depending on the route. Turkish Airlines are one of the few European airlines still offering 4-abreast seating in their premium intra-Europe cabins, but they're sold as business class seats rather than first class. Same situation is in Russia onboard Aeroflot – Russian Airlines intra-Europe flights. On the ground, first-class passengers usually have special check-in and security zones at the airport. Some airlines operate private first-class terminals and/or offer international first class passengers complimentary limousine rides to the airport. While it is typical that these passengers have lounge access, some airlines have separate lounges for first and business where the former may have more luxurious amenities. These passengers can often board the aircraft before other passengers, sometimes through their own jetbridge. Alcoholic and non-alcoholic drinks are complimentary and gourmet meals are usually served with a choice of wine, dessert, and aperitifs. Often these meals have been designed by leading chefs and are served on white linen table cloths and with real cutlery. Historically, first-class air travel has been very expensive. First-class long-haul fares regularly exceed $10,000[which?] per person round trip, as opposed to $4,000–5,000 international business class tickets and $1,000–2,000 economy class tickets. With the emergence of frequent flyer programmes however, passengers have been able to upgrade their business- or economy-class tickets through membership in elite frequent-flyer programs and through the policies of some airlines that allow business and economy-class passengers to purchase last-minute upgrades on a space-available basis. Some airlines also offer upgrading to first class as a bonus to their employees. This is list of airlines with First Class for international flights only. 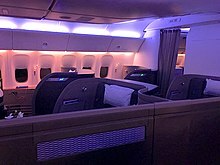 Air New Zealand – Dedicated First Class cabin was previously available on Boeing 747-400 aircraft, but was withdrawn 2006–2007 with the introduction of Premium Economy and flat-bed suites in Business Class. "Business Premier" is now the highest class of service. China Airlines – Dedicated First Class was previously available on Boeing 747-400, with the introduction of Premium Economy and Premium Business Class on its Boeing 777-300ER. "Premium Business Class" is now the highest class of service. LAN Airlines – Dedicated first class cabin comprising a single row of five seats offered on Boeing 767 and Airbus 340 aircraft until late 2009. Philippine Airlines – Dedicated first class or the "Maharlika Class" cabins was withdrawn in mid- 2000's. During the second half of 2006, PAL announced a cabin reconfiguration project for its Boeing 747-400 and Airbus A340-300 aircraft. The airline spent US$85.7 million to remove all first class seats and increase the size of its business and economy seats, leading to the aforementioned new seats; as well as add personal screens with audio and video on-demand (AVOD) across both cabin classes. South African Airways – Dedicated first class cabin was withdrawn in 2001, but First Class could still be seen on some of the older 747-400 aircraft until they were retired in 2007 and 2010. Until 1997, First Class was known as "Blue Diamond Class". Transaero – Imperial Class (aboard some 737 and some Boeing 747 and all 777 aircraft). Turkish Airlines – First Class suites were previously available on long haul 777 aircraft. Progressively removed from September 2011 following the introduction of Comfort Class, the carrier's premium economy product. United Airlines - Long-Haul First Class were open suite style flatbed seats and were on all Boeing 747-400, select Boeing 767-300ER, and select Boeing 777-200ER. First Class was named "Global First" (later "Polaris First"). The first class began to be phased out in 2017 as United retired all their 747-400s. United discontinued all first class services by March 2018, although the first class seats remained on select Boeing 767-300ER and select 777-200ER aircraft with them being sold as Polaris Business until they are refurbished with the same Polaris Business class seats featured on the Boeing 777-300ER aircraft. US Airways – International First Class consisted of six flatbed suites in the first row on the Airbus A330-300. International First Class was eliminated as a separate class of service in 2002, although the seats remained until the A330-300 fleet was refurbished any Envoy passenger could reserve an "Envoy Sleeper" seat in the first row for a small fee at booking, or for free at check-in if seats were available – ground service, on-board service, catering and entertainment were identical to Envoy. ^ "The Residence". Etihad Airways. Retrieved 11 June 2018. ^ "American Airlines First Class Review". The First Class Travel Guide. 2017-01-19. Retrieved 2017-08-08. ^ Woodley, Charles. The History of British European Airways. Casemate Publishers, p. 72. ^ Payne, Emily (2014-04-17). "How First Class travel with British Airways has changed over past 40 years". Daily Mail Online. Retrieved 2017-08-08. ^ "Business Suite". www.malaysiaairlines.com. Retrieved 2018-12-26. ^ "TAM scraps Boeing 777 first class, upgrades business class". Australian Business Traveller. Retrieved 2018-12-26.